NLP stands for Neuro-Linguistic Programming. It was founded based on the idea that if one person can do something well and successfully, can we learn the process for which that person uses and mimic/copy (model) the behavior? It is entirely based off the premise that we process all information off two maps. The Neuro map and the Linguistic map. Neuro stands for our mind. We take information into our minds by our five senses. See, Hear, Feel, Smell and Taste. However, our minds are so utterly brilliant, they constantly "process" this information into data it can use. It uses generalizations, deletions and distortions based on previous knowledge and experiences. The mind doesn't really want to "learn" new things, it simply wants to "understand" the information. Linguistic means language. The second map involved in NLP is the language map. Once we have mapped the information into the mind, we then assign a language value, i.e. and language understanding to the information. Our minds work so fast, we are not even aware that these processes are happening. The beauty of understanding NLP is we can easily conclude that no two maps are alike. So notice, if you are having trouble communicating, understanding that it is a difference in the maps that most likely is at the root of the issues. Our maps are also based on lots of "conclusions" drawn. Perhaps uncovering some those conclusions that might not be working in our favor can be very helpful. NLP when used in conjunction with hypnotherapy can be very powerful tools for change. I have been trained and licensed by Richard Bandler, one of the founders of NLP. 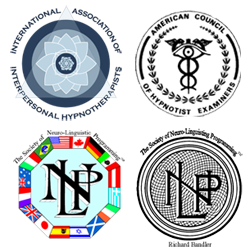 I use NLP techniques combined with very powerful hypnotherapy protocols, helping clients achieve the desired results and lasting change.